Based on reviews of establishments, The Lodge at Atlantic Beach has been voted Best Value for Money in Melkbosstrand for 2015. A variety of bays and beaches, with spectacular sea and mountain views are found in this area. Big Bay is a popular site for surfing and wind surfing. Basic facilities and restaurants can be found in close proximity. Ideal for long walks, sunbathing and safe swimming. Whales are often spotted off the coast. There are adequate basic facilities, benches, grassed areas, footways and kite flying over weekends. A popular site for paddle skiing, this beach has been formed from the lagoon water flowing out to the sea and waves washing water back in shore. Named after the milkwood trees to the north of the town, spectacular views, picnic and recreation areas, shops and restaurants can be found along Beach Road. Adjacent sites include Kapteinsbaai, Van Riebeeckstrand and Duynefontein. With some of the most breathtaking views across the bay and Table Mountain this beach is adequately signposted and some outstanding features include the famous Milnerton Lighthouse. 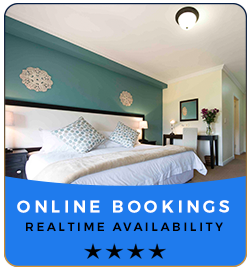 The luxurious 4-star Lodge is situated between Blouberg Hill and the shore of the Atlantic Ocean, a mere 25 minutes from the pulsating heart of Cape Town.